We know enough about canine behavior now to know they learn differently than we do. They aren’t little humans covered in fur. We also know dogs are highly intelligent and masters of observation. They have to be in order to survive, even thrive, in “our” world. They interpret the “unsaid”, the nuances much better than any human. 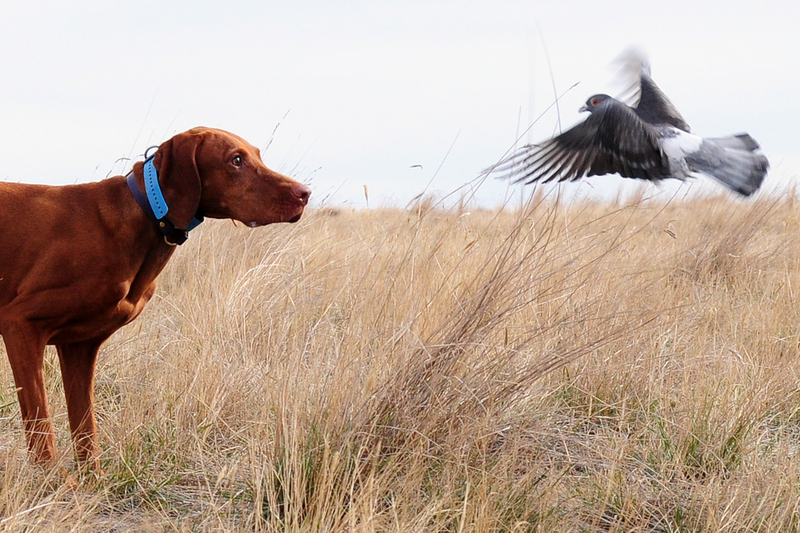 One of my hobbies is training bird dogs (of the pointing variety). I’ve been doing it for enough years I think I have a pretty solid handle on the basics and now enjoy the dogs that are a bit more challenging. These are the ones that really make me think about *HOW THEY SEE THE WORLD* and how they’re interpreting what I’m trying to teach. 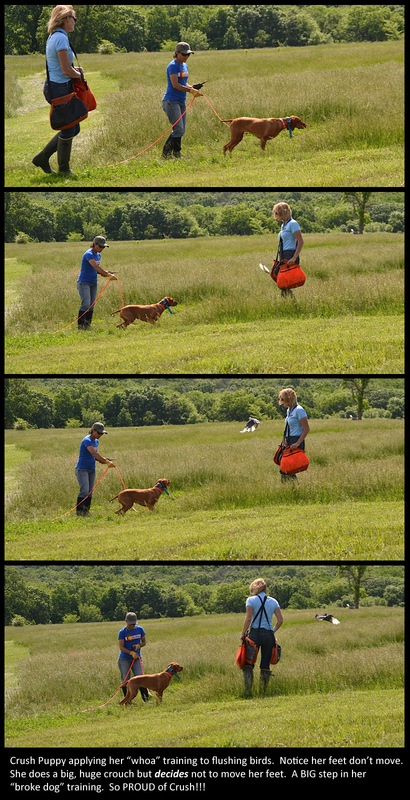 Training a bird dog is so much about the nuances. But, it’s also very much about clarity. 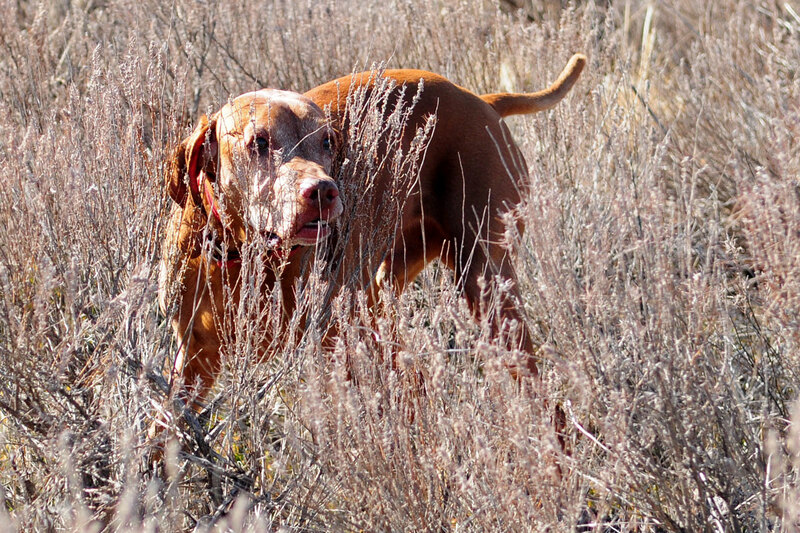 When I’m working with a bird dog I need to be on my toes, observing every glance…every muscle twitch…every head-tilt, flare or twist of the nostrils…for understanding. I have to consider what these pieces, individually or as a whole mean to our training. I also have to be ready for the obvious. When the dog offers something that is clear as a bell, I have to be ready with the proper response–either to reinforce or correct. 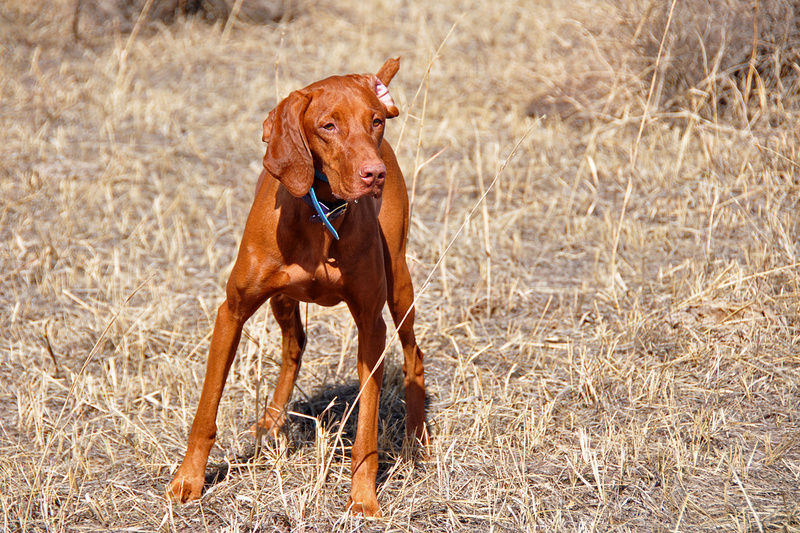 It frustrates me to watch many other trainers, novice and pros alike, working their bird dogs in ways that are so incredibly unfair to the dogs. My hackles rise when I hear people saying “he knows better” or “he’s just being stubborn” or even worse, when they put their dogs in an unfair situation–when they set the dog up to fail because the dog hasn’t been taught how to succeed. Don’t misunderstand. I’m not saying dogs will always make the right choice once they’re given the proper/fair training. I can tell when a dog has been given a solid foundation, a clear understanding of how to perform a specific task and yet chooses to do something different. 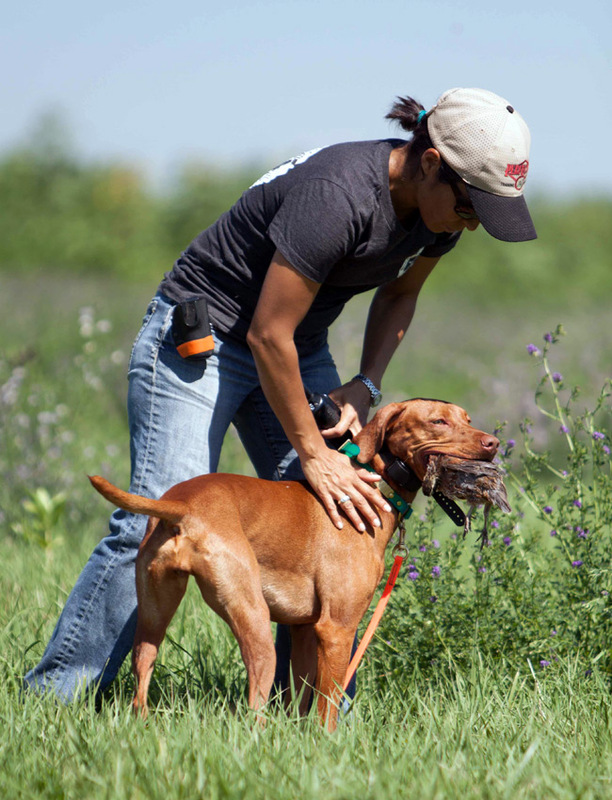 I don’t mind these instances because they provide me with an opportunity to reinforce the training–to reinforce the correct behavior I want from the dog. These are opportunities to provide clarity. Most of the time though the dog truly doesn’t understand. They’ve not been given the proper tools to make the correct choice. Then, they try to offer something–an answer to the question they’ve been asked–but they’ve been set up to fail because they *simply don’t have the CORRECT answer to give*. Crush getting steadied (“green broke”) – How telling her body language is BUT her feet never move! This isn’t fair to the dog. Think about it this way. Say you took a 6 week course on learning conversational German. You’re feeling pretty good about what you’ve learned and you’re ready to be tested. Testing day arrives and there you are, primed and ready. You’re going to ace this thing! The instructor sits opposite of you and begins speaking to you in Spanish. What the heck is happening? You’re unsure how to respond so you TRY by speaking back in German. After all, this is what you were taught. You see the look of disappointment fall across the instructor’s face. He shakes his head and tries again, speaking to you in Spanish. You have no clue what he’s saying. “Stop,” you say. “I don’t understand what you’re saying.” The instructor doesn’t give though. Just continues shaking his head and now, even looks a little frustrated. He tries again, speaking to you in Spanish. You throw up your hands in frustration and give up. You’re confused and frustrated too because this isn’t what you had prepared for. You don’t know how to give the correct response. You haven’t been properly prepared! The instructor jots down your test score–zero. He fails you. How unfair, right? Amante’s Poker Face? Think she’s about to break? Look at her eyes. We’ve all been in situations like this. Perhaps not as obvious, but in situations we felt we hadn’t been given the proper tools to successfully complete a task. 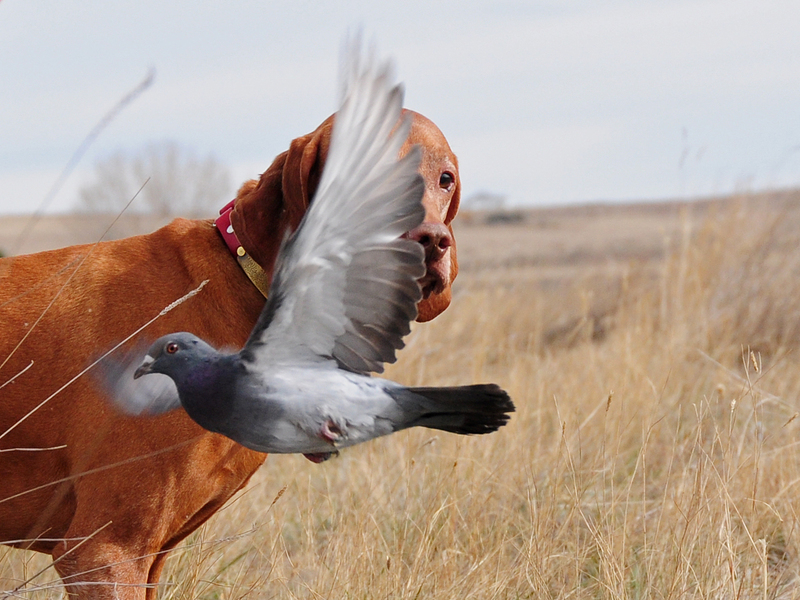 So why are so many of us so unfair in what we ask of our bird dogs? If I’ve said it a thousand times, I’ll likely have to say a million more times. Dogs aren’t robots. They’re not machines that can be programmed exactly the same. They’re individuals just like us. If we want to compete and/or hunt with them, it’s **OUR** job to train them properly. To be fair. It’s **OUR** job to give them the proper tools, to teach them so they understand, so they can make the correct choices when asked. I hope the next time you’re out working with your bird dog, you take a moment to reconsider why your dog isn’t giving you what you ask. I hope you’re able to dig deep, remove your ego and think about whether or not you truly gave your good dog a solid foundation–a solid understanding to complete the task at hand. I hope you decide to be honest with yourself and, if after reflecting you realize you skipped too many steps or didn’t get enough repetitions in of a particular piece of the training so as to proof it, you DECIDE to give your dog a break. I hope you decide to let off the pressure and go back to a place your dog understands then build from there. Amante On Point. She looks AWESOME! Very confident. She *knows* her job! Kosmo On Point — Has a kinda crazy look in his eye. Think he’ll hold through the flush and shot? Kosmo practices steadiness on birds flying *very* close to him. He looks excited…but *controlled*.